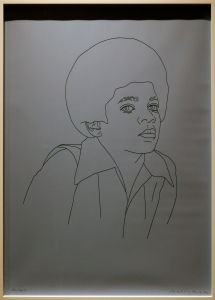 Curated by Dr Nicholas Cullinan, Director of the National Portrait Gallery, Michael Jackson: On the Wall examines how Michael Jackson has inspired some of the leading names in contemporary art, spanning several generations of artists across all media. Michael Jackson is one of the most influential cultural figures to come out of the 20th century and his legacy continues into the 21st century. 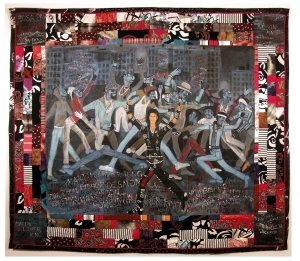 His significance is widely acknowledged when it comes to music, music videos, dance, choreography and fashion, but his influence on contemporary art is an untold story as Michael Jackson has become the most depicted cultural figure in visual art by an extraordinary array of leading contemporary artists since Andy Warhol first used his image in 1982. For the first time, Michael Jackson: On the Wall will bring together the works of almost 50 of these artists, drawn from public and private collections around the world. Artist Graham Dolphin has also created two new works, Thriller x 20 and Off the Wall x 25. 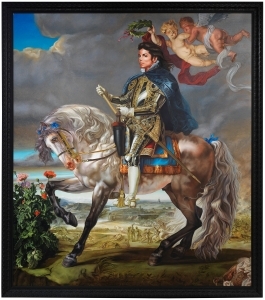 The new works are part of an ongoing series of works by Dolphin, based on Michael Jackson album covers, which explore issues of fandom and idolatry. 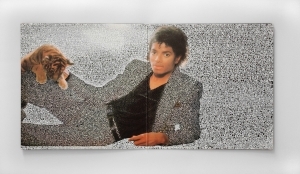 Using multiple copies of Thriller and Off the Wall as his canvas, the artist works directly onto their surfaces. Each cover is drawn over in small, handwritten text containing the complete lyrics of Jackson’s songbook. A Michael Jackson Alphabet by British artist Donald Urquhart was also created especially for the exhibition and charts some of the key moments in Jackson’s life and career while Dara Birnbaum’s The Way You Make Me Feel comprises stills taken from Michael Jackson’s short film for his song of the same name and Yan Pei Ming’s large-scale painting In Memory of Michel Jackson based on a photograph from the early 1980s. 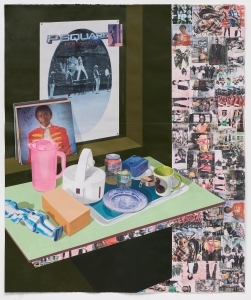 Other works going on display for the first time in the UK include American artist and activist Faith Ringgold’s story quilt Who’s Bad?,a series of collages by Isaac Julien made in 1984 and Jackson’s ‘dinner jacket’ covered with forks, spoons and knives made by costume designer Michael Lee Bush. Keith Haring’s pop-graffiti style portrait of Michael Jackson will also be exhibited for the first time in thirty years.